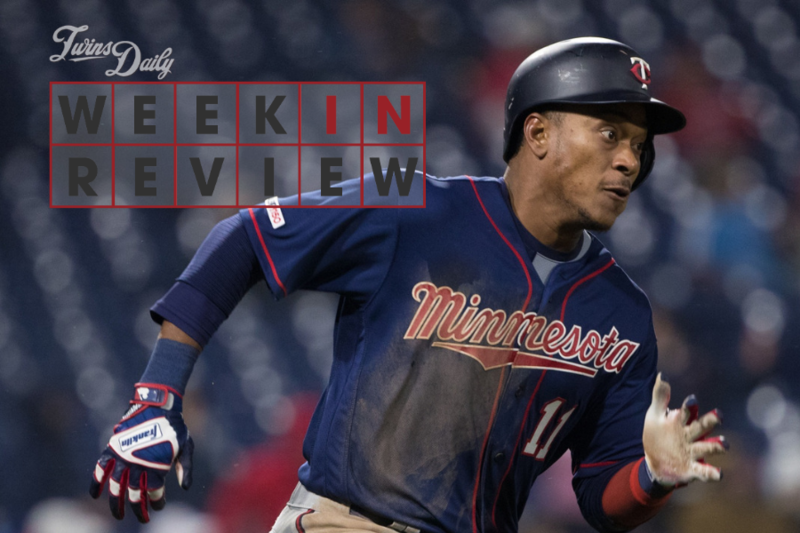 After a successful opening series at home, the Minnesota Twins hit the road and battled hard, posting a winning weekly record with help from multiple comebacks and (mostly) continued excellence from the pitching staff. Read on for a full rundown of the 2019 club's first full week. Before we get underway with this week's column, a few housekeeping notes. On Saturday, the Twins announced they'd designated first baseman Tyler Austin for assignment, in order to make room for right-hander Chase De Jong, who was re-added to the 40-man roster as an insurance arm. Austin can now be plucked by another team, or if he clears waivers he can elect free agency. It's also possible he remains in the Twins organization, but the odds are slim. More importantly, as you can see, I've added a "Willians Watch" tracker above. I just feel like we need to keep our finger on the pulse of this one regularly. For the most part, Friday night's game was a concentrated source of the team's lowlights for the week, but Jorge Polanco was a gleaming exception. While his teammates bumbled along, Polanco was a one-man wrecking crew, hitting for the cycle in his first four at-bats, then adding a single in his final turn for good measure. It was the first cycle by a Twin in about a decade. A year ago at this time, Polanco was coming to grips with the reality of watching his squad start the season from afar. Now he's taking full advantage of being here from the get-go. The shortstop is raking, with a team-leading 12 hits (including six XBHs) in 35 plate appearances. Eddie Rosario hasn't quite found his sustained groove at the plate yet, but he's certainly been clutch. On Tuesday in Kansas City he came through with a game-tying RBI single in the ninth inning that set up a comeback victory. On Wednesday he delivered the decisive blow, a go-ahead RBI single in the ninth that capped another impressive comeback. And on Saturday in Philadelphia, Rosario entered as a pinch-hitter in the ninth, with the Twins nursing a precarious one-run lead, and delivered a three-run blast to seal the win. The left fielder has only six hits on the season so far, and those are three of them. So, there's something to be said for making 'em count. But overall Rosario has opened his campaign in a slump, which makes me more giddy than concerned. I've come to learn that any drought in production for Eddie is usually the precedent for a scorching hot streak. That he's been able to contribute so much with his bat mostly in Silent Mode portends big things ahead. On the pitching side, Michael Pineda backed up his masterful season debut with a convincing encore. The big righty was excellent against the Phillies on Saturday, allowing two runs on four hits over five innings with five strikeouts, while notching his first win since June of 2017. Jose Berrios followed with a terrific outing on Sunday, although his only damage yielded (a two-run homer by Rhys Hoskins in the sixth) proved to be the difference-maker. Berrios has a 2.18 ERA with 21 strikeouts through his first three starts. And of course we've gotta show some love to the bullpen. This unit continues to outshine expectations. Over the past week, Twins relievers combined to allow just five earned runs in 20 2/3 innings (2.18 ERA) with four of those coming in Friday night's rainy affair. Blake Parker chipped in three hitless outings and picked up two saves. Ryne Harper delivered two scoreless appearances in Philly. Trevor Hildenberger and Trevor May combined to pitch six times without allowing a run. As Marwin Gonzalez struggled through each of his appearances in spring training, it reached a point where I openly wondered about his readiness for regular-season action. The comments on that article mostly consisted of, "Who cares, it's spring training," which probably would've been my response under most circumstances. Hours after I published it, Gonzalez struck out four times against the Orioles, with five days left to go before Opening Day. Still, Rocco Baldelli's sentiments reflected the consensus: Asked by a reporter (not me!) post-game about the third baseman's ugly night, Baldelli blinked a few times and said he wouldn't have even thought twice about it had it not been brought up. On Opening Day, Gonzalez delivered the decisive knock for Minnesota, driving in the game's only two runs with a nice piece of opposite-field hitting. We all chuckled. Spring training stats, amirite? The problem is this: Outside of that crucial double in the opener, Gonzalez has looked pretty much exactly the same as he did in spring training – sloppy, ineffective, and borderline lackadaisical. He's 3-for-22 with three singles otherwise, and hasn't been very sharp in the field. We saw his vaunted defensive versatility tested for the first time on Friday, when he slid to first base, and he committed two errors almost immediately. A review of his 2018 season shows that Gonzalez struggled out of the gates for Houston, and he eventually found his footing on the way to a solid year. In fact, April and May have typically been among his worst months, while his offensive has tended to tick up in June and July. So it may well be that these early struggles aren't related to signing late, or a poor spring, but simply part of his normal pattern. Speaking of strong first 2019 impressions that weren't backed up... Jake Odorizzi. The right-hander twirled a gem in his first start and couldn't get through the first inning in his second. Friday was an all-around mess, played under drizzly and chilly conditions. Odorizzi couldn't find his command, throwing 18 of 36 pitches for strikes before being pulled with just two outs recorded. This forced the Twins to use five different relievers, creating a need for extra help over the weekend and – basically – writing Austin's ticket out of town. Said Odorizzi after the game: "I got out there. It was raining. I warmed up. It was raining. The first inning it was raining. I didn't have a feel for the baseball." It bears mentioning that other pitchers in the game didn't seem to have nearly such a hard time, but given how good Odorizzi looked his first time out, I'm inclined to write this one off. We'll see if he can shake off the ugliness of Friday's game and bounce back strong, as the Twins did on Saturday. How hard will Baldelli try to find ABs for Astudillo? Right now, the guy is making an airtight case for regular run in the lineup. Through 114 major-league plate appearances, he's hitting .374/.395/.570, and there's not much in his unorthodox approach – swing at everything, hit everything hard – to suggest it's a mirage. Plus, there's just an undeniable spark he brings when he's in the game. In theory, Astudillo as an everyday player sounds great. In practice, it's not so straightforward. The Twins have two other catchers on the roster; Jason Castro is a steady veteran that pitchers like to work with, and Mitch Garver is a still-developing 28-year-old coming off a strong rookie year. Astudillo can also play third, and started there last Wednesday. But Gonzalez is gonna get his reps there and the eventual return of Miguel Sano (who might start a rehab assignment this week) will further crowd that picture. La Tortuga isn't going to play much outfield. And his pathway at DH is blocked by Nelson Cruz. So where do you get him in? With Jonathan Schoop off to an uninspiring start, I'm eyeing second base as an intriguing possibility. Astudillo made two of his first four MLB starts at second last July, but hasn't played it since. He also logged only 140 innings there in the minors. I'm not sure he has the range or footwork to be a legitimate option at second base, but then again I'm clearly grasping for answers. The Twins need more Tortuga. All four teams got their schedules underway, and the Twins received some premier performances from their top pitchers right away. Friday's arms extravaganza saw Brusdar Graterol and Jorge Alcala deliver gems on each end of Pensacola's doubleheader, Jhoan Duran spin a beauty for Fort Myers, and Jordan Balazovic outshined them all in Cedar Rapids. While there have been glimpses, Minnesota's offense hasn't been quite as explosive as advertised in the early going. It's tough to see that changing at Citi Field, where they'll have to contend with two of the most dominant starting pitchers in baseball. After that two-game set, sandwiched by the last two off days they'll see in a while, the Twins return home to face a Tigers squad that's played well off the block. Forecasts currently call for highs in the 30s and 40s, with a possible mid-week snow storm looming. Shun the Unbeliever! The spawn of Shrek and a Leprechaun is just getting rolling. I agree on Marwin. He looks uninspired, which hopefully can be chalked up to not being 100% healthy. If he didn't have that game winner in the opener, there might be more grumbling about his slow start. Wasn't a fan of the Marwin signing and still aren't. Would rather see Astudillo getting those reps at 3B, Austin getting them at 1B and Cave getting them in the OF. The Marwin signing hurt this team more than it helped it. Now Baldelli feels the need to use him and the youngsters that we already had to cover those spots get pushed back, or even worse in Austin's case get DFA'd. Thanks for calling out Marwin. Some of his at bats have been downright ugly. I know it's early and one good game can change a players stats significantly but right now he is black hole for us.I would rather see Austudillo playing third as he doesn't seem to be as affected by cold weather.Maybe let Marwin handle pinch hit duties until the weather warms up.I wonder if if Rocco corrects course or just shows faith in the veteran.At any rate he is making me wish we had Sano back at third. One of my "mailbag" questions to Seth was asking if Marwin's 0-fer in Spring Training should have us worried. He said NO....so maybe we should trust him. I mean, we do have a lot of baseball left. Let's see how Marwin's average is on May 15 before we start calling him a "bad signing". So far the offense has me frustrated. One game the Twins break out, the next game they fall silent. One game they execute, the next game they leave runners on 3rd base with 1 out. Right now I don't think this team really has a leader on offense when Cruz is out. I feel that Cruz has quickly proven himself the lynch pin for this offense. He gives the guys around him confidence. When he's out everyone's looking around for someone else to step up. Polanco and Kepler seem to be heating up. Nice to see Buxton bounce back from that 3-strikeout game by making contact in the following 2 games. Still waiting to see any kind of power from Jonathan Schoop. Marwin Gonzalez is cold. Cron is luke-warm but we're still waiting on a HR from him also. It's crazy that this team replaced almost half its offense with new guys! Can't wait for them to all settle in and get comfy at Target Field. I dont know where either Astudillo or Garver will end up as hitters, or catchers. But why is Garver considered a developing 28 year old catcher? First off, that's already getting along in MLB years. Secondly it seems it's a rationale for him getting a developmental nod over Astudillo. Sort of strange considering Astudillo is 27! Garver at the present is not as good a catcher, not as good a hitter, and does not have the positional flexibility of Astudillo. . Plus, Astudillo is younger, ergo more time to develop, if that is indeed a factor? Why's it so hard to get Astudillo playing time?Use him at 3rd, use him at 2nd, use him at 1st to rotate in.He's hitting better than any of them.Use him to pinch hit for slumping players when he's not starting. For example: I was looking for them to pinch hit Astudillo for Castro late in the game yesterday.There were several other possible times he could have pinch hit.Why so difficult? While I agree the Turtle will never be Pucket as he just doesn't have his speed I think you are highly underestimating what La Tortuga can be.Since he rarely strikes out (3%) that means he is going to put more balls in play.Since the rough average for balls in play is .300 odds are he is going to be close to a .300 hitter unless he has bad BABIP luck.With good BABIP luck he will hit over .300. He also can hit for power and looks like a decent defensive catcher at this point (at least as good if not better than Garver).Add that all up (especially if he can play catcher) and you have a very valuable MLB player. If he ends up hitting around .300 which baring injury seems likely given his current track record, that would have been the best average on the entire Twins roster last year.Granted he has yet to play a full season of Major League baseball yet, but if you ask me the odds are in his favor to be a better than average catcher in MLB.A catcher who might hit better than JT Realmuto this year.Add to that he can also play 1st, 2nd, 3rd and left field and you have a flexible and valuable player who can fill in when and where needed. Give it time you will be on La Tortuga's bandwagon before long. I think if the Twins are facing a right-handed pitcher, they're going to send Castro up there. Especially yesterday, since he'd gotten a hit earlier. They figured they'd "ride the hot hand" as it were. I know we're all down on Castro (me included) but the Twins can't afford to just give up on him after 8 games. They're going to need him to be at least a .230 hitter this year and that means giving him ABs. With all the new players, I was concerned about getting off to a decent start. The Twins are 3-3 against contenders (Indians, Phillies) and 2-0 against weak teams (Royals). They're 2-1 at home and 3-2 on the road. So far so good. A split with the Mets would be a nice way to end the road trip. They get DeGrom and Syndergaard, so this will be a real test. When Sano is ready, it really presents and interesting situation for the Twins.I imagine they will get creative and someone will head to the IL...you know the drill. But do you trust Sano to stay healthy?Need to keep someone on staff to handle 3rd base if he stubs his toe. Longer term, Gonzalez was brought in as the utility guy, not Astudillo.I think this will really be the first big test of our young managers career assuming he is part of the decision.Keep the veteran over the young guy even if the young guy continues to perform? And how does that affect team chemistry? I don't know what Sano's timeframe is but Gonzalez needs to be performing up to a higher level when that day comes.Should be interesting. One thing I thought should be added to the "lows" of the week is Martin Perez. He pitched terribly when he came in, struggling with walks especially. He's been an awful pitcher and people rode the hype train of spring training to go along with his pitching style similar to Johan's. Also, what the heck was with the lineup yesterday? Our best players getting the day off before an off day is not ideal. Why is it far fetched to suggest he can't be the super sub that Marwin or others have been, giving other players an occasional day off? Agreed. I was hoping that the Twins could at least scratch out a 2-3 record vs the Phillies and Mets. Tall task going up against Thor and deGrom. Hopefully they can get one. IMO, the key for Astudillo's value is the developing power, not the 'defensive flexibility'. A .300 hitter isn't that valuable if it comes with zero walks and no power (and no base-running)...which was the case with Astudillo for the majority of his professional career. But, his power seems to be developing...showing way more SLG in the last couple of years than he had earlier in his professional career. So, if the x-base hits continue to come along, he has a very legitimate shot to hit his way into a regular major-league role. I just think it's going to be as a catcher/DH or as a 3rd-baseman. It seems pretty clear that the Twins consider him only an emergency option in the outfield, and no option at all in the middle infield. So, in that regard, it's not looking, at least so far, like he's going to be a 'super-utility' guy. I don't get the knocks against Castro. I thought it was well known that Castro was a 2 tool catcher, good with pitchers and good at throwing out runners but a marginal bat. Moving on: I think Astudillo is one of those players who brings those "impossible to define but definitely can see" intangibles to the team. While I was disappointed with the outcome of the game yesterday, it was nice to the the Twins put together two solid games after three games of barf-ball. Can't really compare a college pick to a 16 year old signing in terms of development age. Astudillo may be a year younger than garver, but he's already been playing pro baseball 11 years now. Cron has looked really good at 1B. Really good. The difference between him and the other two guys to play there in 2019 has been stark. He looks like a GG contender so far this young season (in the innings I've watched). The interesting thing thing about Astudillo behind the plate is that the kind of quantifiable and evaluative performance that fans can see, framing, blocking pitches in the dirt and controlling the run game, he has been essentially equal to, if not arguably best, of the three catchers on the roster in his limited time. His minor league numbers at catcher speak to the same level of proficiency. Game calling is unquantifiable by us rubes but is he really that much worse that Garver and/or Castro? He's a superior hitter to most of the players on the roster and the undisputed best hitter among our catching corp. I do love that Astudillo plays for my favorite team. He's been a BP/Fangraphs darling for a few years now and I had been following him since first hearing about the oddity of his offensive profile. I'd be cheering for the guy even if he wore the laundry of the Yankees or White Sox, but it's the Twins that happen to be the team with the second most interesting player in MLB. That's amazing. So using this formula: Astudillo started pro ball at 16? Garver after or during college, let's generously say 21? Meaning that Garver has until age 33 to develop as a catcher to the level Astudillo is now? What was Garver doing after classes in college? I doubt there is a formula. I'm just saying, their ages are deceptive when compared directly. College coaches are mostly trying to win ballgames, not waste the little time they have these guys on long term development. #1 - If the Twins win 6 out of every 10 games. They will finish with 97 Wins. If the Twins split with the Mets they will start the season 6-4... RIGHT ON PACE BABY!!!! #2 - I'm Mr. Position Flexibility and I love the flexibility that Astudillo provides. However... he is the one guy that I would try to limit that flexibility with... the reason. He can CATCH... legitimately catch. He is not a defensive issue behind the plate. Take that bat behind the plate and you are instantly ahead of the rest of the league at the position from an offensive standpoint. #3 - Everybody was willing to overpay steeply for JT Realmuto... If Astudillo hits like Realmuto (right now he is hitting better than Realmuto)... Maybe Astudillo establishes similar value. If Astudillo can play defense... and it sure looks like he can and hit... what kind of value have you created? The Twins need to look long term and think value and give Astudillo the keys to the catching kingdom until he shows he can't produce. #4 - However... if the Twins insist on carrying three catchers... then Astudillo has to be used at 3B more often to get the AB's he deserves. #5 - Astudillo playing 3B until Sano gets back shouldn't be a problem. Marwin was signed as an "everyday utility player". The plan was to move him around... the Twins can always go back to that plan. Sano gets hurt and now Marwin is the everyday 3B... that "everyday utility player" designation sure must be fragile if that is all it took. That was 5 things to think about. If only there were a game thread tonight. "Perhaps Willians Astudillo's influence is rubbing off on his teammates. Led by the nemesis of the three true outcomes himself, the Twins' lineup has largely found ways to put the ball in play so far, as Minnesota's 61 strikeouts rank second-fewest and 23 walks are fifth-fewest in the Major Leagues." Strikeouts is good news and a good trend. Walks.... not so much.